Near the 700m of the opening race at Rosehill, Roheryn was some 26m off the leader and winner Chess Star. The first 300m of the 1100m race was telling in the fortunes of the boom Godolphin colt as Chess Star ran 19.04 while Roheryn clocked 20.37 according to Punters Intel. And that’d be a large part of the reason he conceded that 26m. Roheryn then ran the third fastest 800m-600m of 11.20 before he started to warm up, running the fastest last 600m of the day in 32.35. The last 600m comprised 10.92 (600m-400m), 10.59 (400m-200m) and a final 200m of 10.84, the second fastest last 200m for the day. Chess Star slowed the speed between the 800m and the 600m running 11.22. 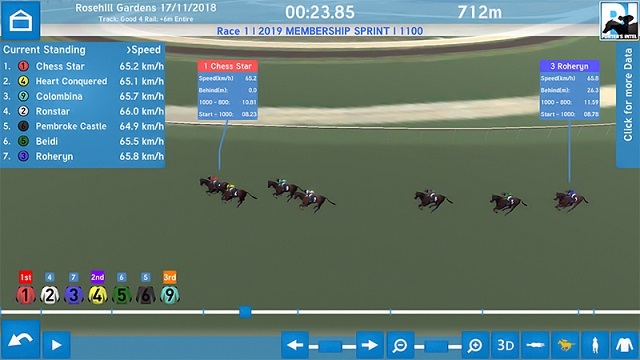 While Roheryn ran faster sectionals all the way to the line jockey Adam Hyeronimus was able to increase the tempo on Chess Star (last 600m 33.31) running 11.01 and 10.92 before he paddled the last 200m in 11.38 but had a big enough break as Roheryn was still 15m off him around the 200m mark. There were three 1100m races run at Rosehill - the three-year-olds, the Highway and a Benchmark 94. Chess Star ran 1:03.64, the Highway was considerably slower in 1:04.31 while the BM94, won by Isaurian, was 1:03.42. In the latter, leader and runner-up Tango Rain ran his first 500m in 29.90 while Chess Star clocked 30.26 for the same section of his race. Chess Star was able to increase the tempo from the 800m to the 200m while Tango Rain’s sections slowed for each 200m split to the line. While on the BM94, the eye-catcher was fourth placed Jorda who missed the start, and took a while to wind up, before screaming home in 32.72 for her last 600m, easily best of the race, and 11.01 final 200m. It was her first glimpse of form this campaign and she could go on with it. Quality mare Seasons never looked out of second gear in her first-up win over 1200m and, curiously, she didn’t run the fastest split for any part of the race yet still recorded a slick 33.44 for her last 600m. That was the second best of the race behind Nicci’s Gold who ran 33.24 and produced the fastest 200m sections for four of the six 200m splits including 11.18 for the final 200m. Asterius produced one of the runs of the day with his first-up eighth in the final event, over 1300m. A shade slow out, the grey was a clear last near the 800m where he started to wind up and run off 33.37 for his last 600m. He was the only horse to break 11 seconds (10.99) for the last 200m in that event. While Schubert (33.26) managed the best last 600m of the race his run was ending as Asterius was holding his own late. Favourite Newsfan lost no admirers despite her defeat, she ran 33.41 for her last 600m to fail narrowly. My Nordic Hero isn’t a noted 1400m performer so his first-up effort behind Firsthand was a promising one. He clocked 32.81 for his last 600m but was just outsprinted by Firsthand in the last 200m with the winner running the best final 200m of the day in 10.75. With his best form around the 2000m mark and on soft tracks if he strikes that combination My Nordic Hero will take some beating but it appears he’s come back in fantastic order regardless. Don’t miss Punters Intel on Sky Thoroughbred Central at 7pm on Tuesdays.